SO DEAR TO MY HEART - 1949 - ORIGINAL ONE SHEET (27 " X 41") MOVIE POSTER. POSTER IS IN EXCELLENT CONDITION AND LINEN BACKED. THIS IS NOT A VIDEO OR REPRODUCTION POSTER , THIS IS AN ORIGINAL THEATRICAL MOVIE POSTER PRINTED BY THE MOVIE STUDIOS. 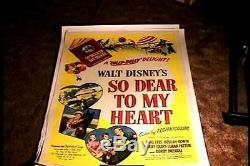 The item "SO DEAR TO MY HEART ORIG MOVIE POSTER 1949 LINEN WALT DISNEY BURL IVES" is in sale since Sunday, January 11, 2015. This item is in the category "Entertainment Memorabilia\Movie Memorabilia\Posters\Originals-United States\1950-59".